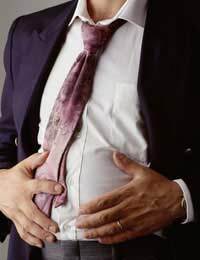 Stomach ulcers and duodenal ulcers are very common in industrialised nations such as the USA, Australia, the UK and other countries in Europe. For a long time, experts thought that ulcers were caused by eating specific foods that stimulated the production of acid in the stomach. Spicy foods were thought to be a high risk. Stress was also considered a major risk factor. People who had very stressful lifestyles appeared to be very prone to developing stomach problems. In the 1980s, this thinking was turned upside down by the work of two Australian scientists. Barry Marshall and his collaborator Robin Warren started studying the bacterium Helicobacter pylori cultured from the stomachs of patients with gastritis – an acute inflammation that affects the inner lining of the stomach. They developed a theory that H. pylori could cause gastritis, and that this bacterium was also likely to be a causal agent in stomach ulcers and gastric cancer. At first, the established medical world was highly sceptical and Marshall had to prove his case by drinking a culture of H. pylori and giving himself gastritis. He published the results in a major medical journal and further research proved that he was right. It is now accepted that H. pylori is responsible for most stomach ulcers. Those that are not caused by bacterial infection are usually due to the damaging effects of chronic use of non-steroidal anti-inflammatory drugs such as aspirin. Ibuprofen, when used over a long period of time, can also cause enough stomach damage for an ulcer to develop. One of the reasons for the general disbelief that H. pylori could be linked with stomach disorders was that no bacterium had ever been shown to be able to live in the acid conditions of the stomach. We now know that H. pylori manages to survive the acid by using an enzyme called urease. This enzyme breaks down urea, which the bacterium secretes into the stomach, to form carbon dioxide and ammonia. Ammonia neutralises the stomach acid, giving the bacterium enough time to survive and burrow into the thick layer of mucus that lines the stomach. Once there, the bacteria are hidden from the acid and can divide unhindered. Some even invade the cells lining the stomach, further protecting themselves from the acid in the main stomach chamber. H. Pylori is a gram negative bacterium that has an unusual shape. It looks like a corkscrew and has a helical form. This is an adaptation to where it lives – its shape enables it to drill through the stomach mucus. Although H. pylori is a common cause of stomach ulcers, not everyone who is infected will develop an ulcer. In fact, it is estimated that around half of the world’s population is chronically infected with this bacterium, and only one fifth of them will go on to get a stomach ulcer. Although other bacteria are suspected of causing other types of cancer, the only association that can be proven is the link between H. pylori and gastric cancer. Several lines of evidence demonstrate the link, including tests in animal models and treatment of H. pylori infections in people with gastric cancer. In one recent study, Japanese patients who were treated with antibiotics to eliminate H. pylori after surgery to remove the cancer had a much lower risk of their cancer recurring. Being able to prevent gastric cancer by eliminating the bacterial infection is indirect but strong evidence of a causal association. In areas where there are many cases of gastric cancer in the population, such as in Japan, there is a good case for screening people to see if they are infected with H. pylori. By treating those who have an infection, it may be possible to reduce the risk of primary gastric cancers, as well as recurrence of gastric tumours after treatment. @PacMom - Have you been suffering from the likes of fever, chills, severe headache, vomiting, and other influenza-type symptoms, if so then there could be a possibility. However, your doctor will tell you if it has done listeria tests (which I suspect not) and your doctor would tell you if you had contracted listeria. Is it possible to have H-pylori and Listeria at the same time?I tested positive for H-pylori from my endoscopy. I suspected it & asked for the test prior to the procedure and was told it is automatically tested for anyway. Is Listeria tested also? I am concerned because of the overlapping symptoms and the recent outbreak of Listeria and recall on my favorite ice cream that I heavily consumed. Thank you.